Image of the U-slot dual-band planar inverted-F (PIFA). 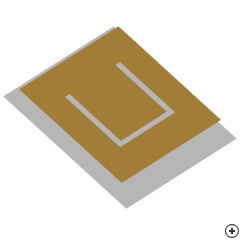 Dual-band operation of a planar inverted-F antenna using a U-shaped slot was proposed by Salonen , P., with an intended use for Wireless LAN at 2.4 / 5.2 GHz (IEEE 802.11b/a). The lower and upper frequencies are primarily determined by the dimensions of the outer and inner plate respectively. This antenna is typically only used where there are tight constraints on the physical dimensions and the antenna operates in a multi-path environment, e.g. cell phones and wireless LAN. The performance of this and related compact antennas is typically poor compared with larger, conventional antennas. The radiation pattern and mode of operation are not well defined, especially for the upper frequency band, where the pattern tends to deviate from omnidirectional and changes rapidly with frequency. In the geometry used here, the short is placed asymmetrically on the side facing the upper end of the U-shaped slot. However, there are numerous possible feed/short configurations.